Bizagi allows managing your licenses to easily adapt to the changes in your organization. You can move the user licenses to a new server or to an existing server at any moment without additional charges. Also, you will always be able to keep track of your invoices. To view and download your invoices please sign in to Bizagi Portal with your online account credentials. Select Internal Purchases on the main menu and then click on Invoices on the sub-menu. Please be aware that you are buying directly from Bizagi, no intermediaries involved. Click download button to download desired invoice. 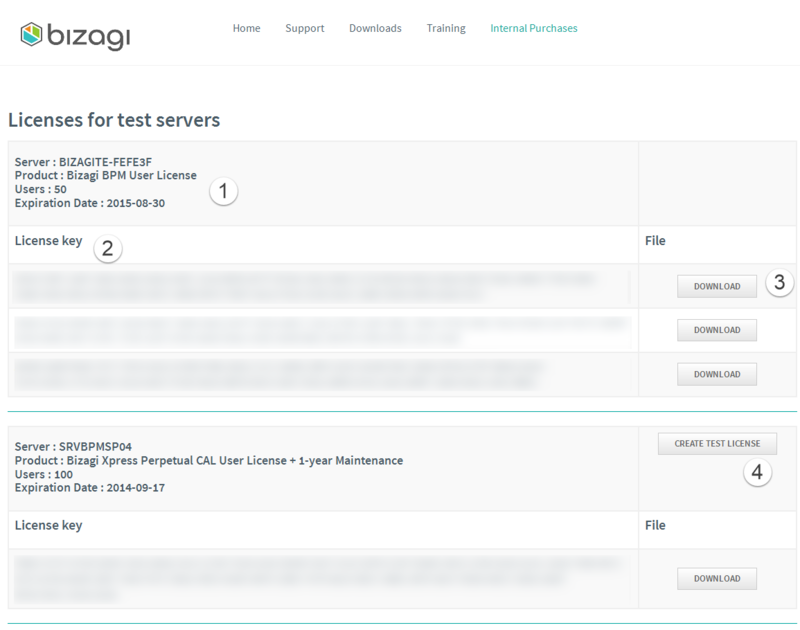 Bizagi enables 20 users for the Testing environment. If you need more users in you testing environment, you can generate licenses for testing. 1. 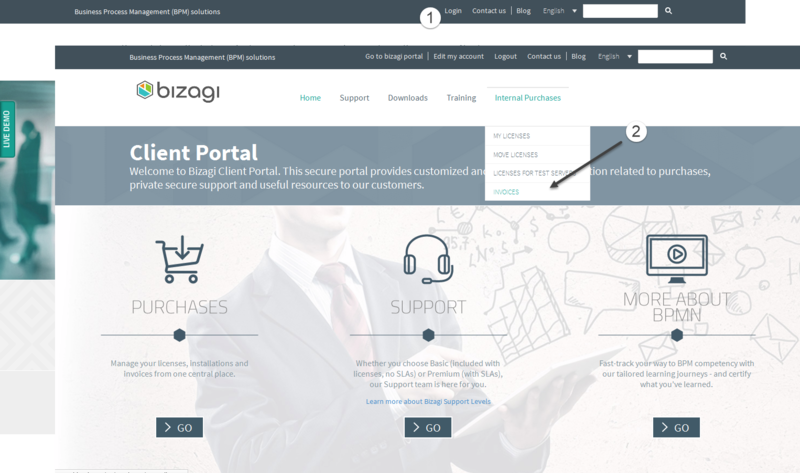 Sign in to Bizagi portal with your online account credentials and hover over Internal Purchases on the main menu. Then select Licenses for test servers. 2. A list with all your licenses for test servers will display. Click on Create Test License in the licensed server you want to create a new Test License. Product: Name of the product. Users: Number of users the original license has been purchased for. Expiration Date: Last day the license will be valid. A button to download the Order Confirmation of the key. The keys for test servers. These keys can be generated up to three (3). This button will automatically create a Testing license with the same Product, number of users and expiry date than the original one. 3. The created Licenses will be displayed and listed. Once you have created three Licenses, the Generate button will disappear. 4. Copy and paste the License in the Management Console to activate it. You can move your Licenses to a new server or to an existing server. Keep in mind that the moving Licenses MUST be performed between servers that have THE SAME PRODUCT. If you need to move User Licenses, please contact Customer support. If you need to move User Licenses, you may move all the users of a License or a determined number of users, according to your needs. Keep in mind that each purchase (license) has a separate expiration date. If you want to unify the renewal dates into a single one, please contact a sales representative.